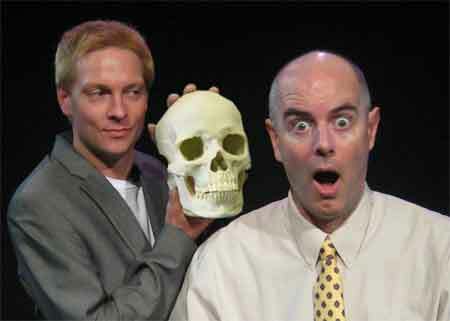 Teaching Hamlet is the latest offering from Keir Cutler, a Fringe circuit favorite. This is his 10th appearance at the Toronto Fringe. It’s a two person show, a departure from his previous monologues. Appearing with him is Montreal actor Brett Watson. Cutler plays Joe, the bombastic president of the local chapter of the Oxfordians. Watson is Connor Hamilton, a pompous Shakespearean actor who is playing Hamlet. Oxfordians believe that the works attributed to Shakespeare were actually written by Edward de Vere the 17th Earl of Oxford. Joe has hired Connor to make a video that can be used to recruit more Oxfordians and to annoy the Stratfordians, a group who thinks that someone called Shocks Peer was the actual author (according to Joe – check Wikipedia for a different slant). Lots of laughter on offer. The opening scene is worth the price of admission. Joe wrestles with a tripod, hilarity ensues. To me Cutler’s performance seemed a bit over the top, almost a caricature, while Watson’s was more restrained. At one point Joe is showing Connor what to say and how to say it for the the video and his arm movements and body language are awkward and exagerrated. The diologue is funny. It’s lovely to listen as Hamilton reverses himself and changes his opinion time and again in order to stay onside with Joe and get paid the $10,000 fee for making the video. The last part of the play is quite touching as Joe reveals the truth about himself and the local Oxfordians. It seems to me that the play exists to teach the audience, to make them questions Shakespeare’s authorship or, at the very least, go look up the Oxfordians and the Stratfordians on Wikipedia. I enjoyed the show, it was a pleasant way to spend an hour. All individual Fringe tickets are $10 ($5 for FringeKids) at the door (cash only) and go on sale one hour before showtime. 50% of tickets are available in advance and are $11 ($9 + $2 service charge), these can be purchased online at www.fringetoronto.com, by phone at 416-966-1062 ext. 1, or in person during the festival at the Festival Box Office in the parking lot behind Honest Ed’s (581 Bloor St W). Previous PostBattle of the Bastards (You Rung?) 2013 Toronto Fringe ReviewNext PostFringe for Free! Toronto Fringe ticket giveaways for shows playing on Monday, June 8th.